Our Robotics Team stands proudly with their 2nd place medals and trophies and of course their robot- Vortex! This morning brought us more qualification rounds. At the end of qualifications we were ranked third. Picking alliances started and the number one picked the number two seed so we moved up to second seed and chose the now sixth seed team, The Duluth Daredevils- team 2512. Picking alliances went on and our last alliance member was Team Nicolet F.E.A.R.- team 4786. They have a great human player who scored an average of 30 points per match by throwing noodles over to the opponent’s side. Tournament rounds started and me won every match and put ourselves in the championship. In the championship we would have to win two out of three matches. We lost our first match and prepared for the second one. 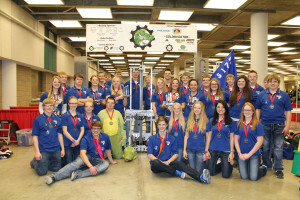 With all of our hard work we were still unable to beat alliance team number one. We took second place. We would like to thank our alliance members on helping us take second place, without them we wouldn’t have been able to. Awards ceremony started right after the championship match and we won the quality award which looks at how your robot is built. We also were runner up for team safety and earned our safety hat pins. Our junkyard robot won third place and even had someone offer to buy her but we loved her so much we couldn’t sell her. It was a great weekend full of competition! Everyone is very excited and look forward to hopefully qualifying for the State Tournament in May!